A two-way pool table that you can use for playing snooker too. The HLC 6ft Green Foldaway Pool Table give you the best value for your money as it gives you a pool table and snooker table in one. This comes complete with both pool accessories and snooker accessories. What more could you ask for? A price like this is unbelievable enough, let alone for a 2-in-1 table, right? 3 What makes HLC 6ft Green Foldaway Pool Table the best small pool table? Do you want to spice up the use of your pool table than just using it to play pool? Don’t you wish at times you can play another game, snooker perhaps? Well any pool table can be used as a﻿﻿ ﻿﻿﻿﻿﻿﻿﻿s﻿﻿noo﻿﻿ker table. The only problem you may likely have is that, you don’t have snooker balls. So instead of purchasing a set of snooker balls (which by the way doesn’t come cheap) you settle with playing just pool. That dilemma of whether you’d buy snooker accessories has come to an end thanks to this fully equipped HLC 6ft Green Foldaway Pool Table. Seen in the photo is the 2-in-1 Pool and Snooker table from HLC. The HLC 6ft Green Foldaway Pool Table is built exactly for user’s enjoyment and convenience. Given some careful thought into, the manufacturer ensures that you get your money’s worth and more with this piece. Its playing surface is different than other small pool tables, but in a good way. Its vertical folding design makes it suitable for small rooms. Not just that, its foldable design also makes it portable and easy to store. 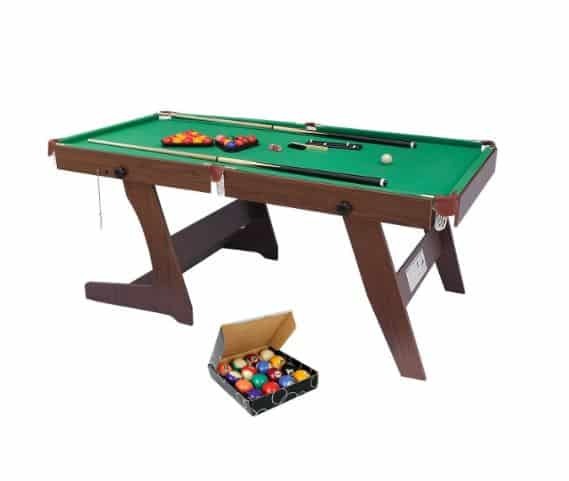 What makes HLC 6ft Green Foldaway Pool Table the best small pool table? It is not often that you get an offer this affordable for a package of this magnitude. As the saying goes, you can’t have the best of two worlds. But that is proven wrong by the HLC 6ft Green Foldaway Pool Table set. It gives you the guarantee of maximum enjoyment due to its package inclusions. Quality is not totally sacrificed too. The HLC 6ft Green Foldaway Pool Tabl﻿﻿﻿e has 20% 5-star rating, 10% 4-star rating and 70% of the rest of the rating values. The numbers are really not so good, making the average star rating for the table a 2.5 out of 5.